Preheat oven to 350 degrees. Line a 9 x 13 inch pan with parchment paper, leaving flaps on either side of the pan to form "handles". Spray the parchment with cooking spray. Beat egg whites on high speed until soft peaks form. With the mixer on, pour in remaining 1/4 cup sugar and beat until egg whites are stiff. Bake for 35 to 45 minutes or until a toothpick comes out clean. Cool the cake in a baking rack, then turn cake out onto a rimmed platter. Combine condensed milk, evaporated milk, and heavy cream in a small jar or pitcher. When cake is cool, pierce the surface with a fork or toothpick several times. Slowly drizzle all but about 1/2 cup of the milk mixture—use a basting brush to get as much around the edges of the cake as you can. Allow the cake to absorb the milk mixture for at least 30 minutes. To ice the cake, whip 1 3/4 cups heavy cream with 2 1/2 tablespoons of sugar until it's thick and spreadable. 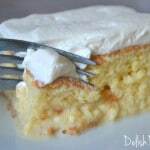 Spread the whipped cream over the surface of the cake. Cut into squares and serve.